After Likud MK Tzachi Hanegbi loudly booed during speech, Bennett says memorial rally deteriorated into a 'shameful leftist demonstration'. 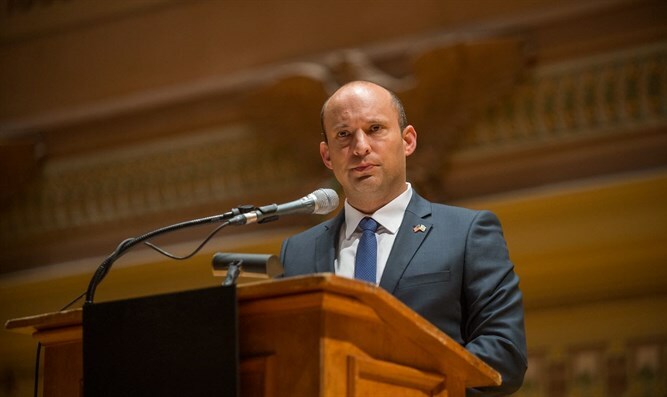 Jewish Home Chairman Naftali Bennett blasted Saturday evening's memorial rally as a "shameful leftist demonstration" after Likud MK Tzachi Hanegbi was roundly booed by the assembled crowd during his address. "The right did not murder Rabin but Yigal Amir," said Bennett. "As a right-wing leader who opposes a Palestinian state, I am tired of the annual false accusations of the left." "Rightists do not need to come to a demonstration whose goal is to denounce the right. The lesson of the extreme left: The right is to blame. My lesson: neither violence nor civil war. Choose," continued Bennett. Minister Gila Gamliel of the Likud also denounced the "shameful scenes tonight in Rabin Square. A bunch of anti-democratic shouts who do not respect a minister elected in the government, and then they preach to us about division and tolerance". Rabin was assassinated on November 4, 1995, by Yigal Amir following a political rally in Tel Aviv. Ever since Rabin's death, many in the Israeli left claim that incitement by rightist leaders, and specifically Netanyahu who headed the opposition at the time, led to Rabin’s assassination. Hanegbi, a long time Likud lawmaker, was lustily booed during his speech. Many rallygoers were also shown making obscene gestures at the veteran legislator. Earlier this week, the Meretz party expressed outrage after it was announced that Likud Minister Tzachi Hanegbi would speak at the Rabin memorial. "Memory is not bought with money, and neither is peace. Those who sang the song of peace next to Yitzhak Rabin were removed from the memorial, while those who stood on the veranda and incited will be there,” the party said. “Since the name of the host has not been made public, we hope it will not be Itamar Ben Gvir. He already has the ornament," added Meretz, referring to the rightist lawyer who famously tore off the hood ornament of Rabin's limousine shortly before his murder.